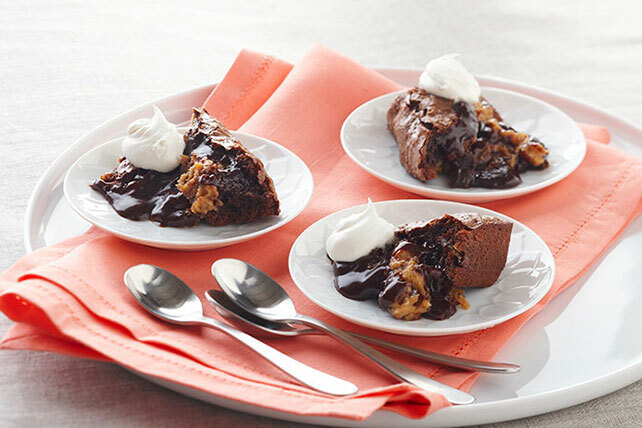 Chocolate cake + peanut butter + an ooey-gooey center = a chocolate molten cake that's everyone's new favorite dessert. Microwave chocolate and butter in large microwaveable bowl on HIGH 1 to 1-1/2 min. or until chocolate is almost melted. Stir with whisk until chocolate is completely melted. Stir in powdered sugar. Blend in whole eggs and egg yolks. Stir in flour; set aside. Mix cream cheese, peanut butter, brown sugar and vanilla until well blended. Pour half the chocolate batter into 1-qt. souffle dish sprayed with cooking spray; cover with layers of cream cheese mixture and remaining chocolate batter. Bake 20 min. or until edge is set but center is still slightly soft. Cool slightly. Serve topped with COOL WHIP. One serving, 1/2 cup, of this indulgent cake goes a long way on flavor! Prepare and layer batters as directed, substituting 7 (3/4-cup) custard cups for the souffle dish. Place filled custard cups on baking sheet; bake at 425°F 13 to 14 min. or until edges are set but centers are still slightly soft. Continue as directed. Makes 7 servings. Substitute a 1-qt. casserole for the souffle dish.